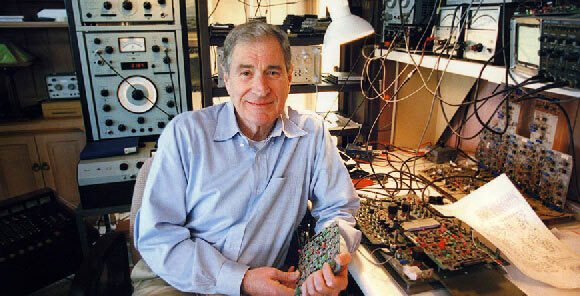 Ray Milton Dolby was an American inventor and sound engineer who invented noise reduction technology, now widely used in cinemas. He was born in Portland, Oregon in 1933, to Earl and Esther Dolby and raised in San Francisco. As a child, he had a deeply rooted interest in electronics and mechanics. During his high school years, Alex Poniatoff, the founder of Ampex Technologies, came to his school to give a presentation and asked for a projectionists to aid his presentation. Dolby volunteered to do this, and Poniatoff was impressed by Dolby’s level of skill. He offered Dolby part time work at Ampex to which Dolby agreed as he was already ahead in his credits and didn’t have to worry about getting into college. Dolby went to school three hours a day, and worked five hours at Ampex. He contributed to the development of their first audio tape recorder launched in 1949. He attended San Jose State College and later transferred to Stanford University, with a gap of two years for army service. While at college, he made rudimentary models of video tape recorders for Poniatoff in the capacity of a “consultant” as he was still a student at college and had yet to receive a degree. Dolby’s contributions were instrumental in developing the first “Quadruplex” video tape recorder launched by Ampex in 1956. Dolby received a B.S. in Electrical Engineering from Stanford in 1957 and then won the Marshall Scholarship for his Ph.D. for which he chose to go to University of Cambridge in United Kingdom. He completed his Ph.D. in Physics in 1961 and worked as a consultant for the Atomic Energy Authority in UK. At Cambridge he met his future wife, a German summer student named Dagmar Bäumert. When Dolby worked as a United Nation’s advisor in India for two years, Dagmar joined him there. Dolby later came back to London to found Dolby Laboratories in 1965. The company was founded with a staff strength of four. In its founding year, Dolby invented a noise reducing electronic filter which he called the “Dolby Sound System”. This technology eliminated the level of noise or “hiss” in playback sound and vastly improved the sound quality. The product’s first sales were to Decca Records, before the technology was even patented. This was eventually done in 1969, four years later, after he had moved back to the United States. The move coincided with the birth of their first child and Dolby’s motive in moving his family to San Francisco was to give his children the same happy California childhood that he had received. The move turned out to be fortuitous, as it put him in close proximity to the Hollywood film industry where both his inventions and his company prospered. His success with the film industry made him a billionaire and allowed him to enjoy a lavish lifestyle with a house overlooking the Golden Gate Bridge in San Francisco, a private yacht, and the luxury to invent and invest in things that interested him most. The company was initially privately held but went public in 2005, with stocks surging on the first day of trading, making Dolby wealthier than ever. Dolby’s noise reduction technology is vital to the cinema experience of today and he received public recognition and acclaim for it. Some of his honors include a US National Medal of Technology, induction into the National Inventors Hall of Fame in 2004, two Oscars, numerous Emmy Awards, a Grammy Award, an honorary Order of the British Empire and a star on the Hollywood Walk of Fame. He died in September 2013 with an estimated net worth of $2.85 billion, which has now passed on to his wife, two sons and four grandchildren.